Nearly every restaurant in Hawaii has Pacific fusion-inspired cuisine. Pacific fusion restaurants are very popular in Hawaii, stemming from Hawaii's geography between the US and Asia. Pacific Fusion-style menu's are a blend of Asian, American, and often Hawaiian cooking styles. Using traditional flavors, ingredients, and cooking methods of each culture to create some tantalizing dishes. 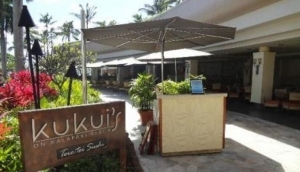 Find your favorite Hawaii Pacific fusion restaurant.